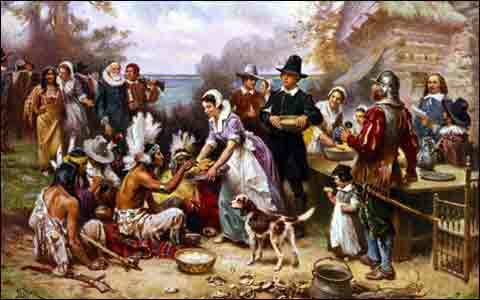 When the Pilgrims and Native Americans shared that first Thanksgiving feast in 1621, they not only gave us a great model of community and friendship (at least for a time), they also hosted the original potluck. The blueprint they left for hosting large gatherings is relevant even today. For starters, note that everybody who attended brought something—and it was something substantial – deer, a string of cod or a half-dozen pheasants. Nobody tried to slide by with a measly 2-liter or a bag of chips. Also, there was no prolonged and painful analysis over food origin. It was organic. All of it. Some of it was so organic that it was still warm, wearing feathers and had a faint heartbeat. We think we’re pretty original today, but the Native Americans and Pilgrims were the first farm-to-table fresh food people. Their eggs were free-range, their chickens were free-range and so were their kids. Dietary restrictions hadn’t been invented yet, so nobody dissected the carb count of the corn pudding, questioned whether the milk was whole or skim or announced they weren’t eating the pie if it had sugar in it. What’s more, nobody put a damper on the meal by wearing a Fitbit to the table or checking calorie counts on a mobile device. They came to the table and did what you’re supposed to do at the Thanksgiving table. They ate. And ate and ate and ate. It probably also helped that they had a serious language barrier. Nobody was able to blow the day up by talking politics or rehashing the election. They didn’t talk much at all; between courses they went target shooting and had wrestling matches. If things get tense at your gathering this year, consider switching to a foreign language. Or challenging someone to a wrestling match. It was also genius that they hosted the meal outside. They not only captured that woodsy, rustic ambiance so popular today, but clean-up was a cinch. What the dogs didn’t eat, the bears and raccoons took care of at night. If it’s above 50 degrees where you live, think about it. We could learn a thing or two about simplicity from that first feast as well. Not a single woman pondered whether to use the everyday dishes, break out the good china or go with paper plates. For the most part, they ate State-Fair style—food–on-a-stick. Nor did they spend half a day devising a clever theme for the get-together. In those days, every meal had the same theme – survival. Nobody had to be called to the table twice, nobody picked at their food, nobody had to be told to clean up their plate and nobody worried about running out of ice. Despite differences in food traditions, backgrounds, ethnicity and language, they shared a profound appreciation for the bounty provided by the divine Creator. Thankfulness was like food—a shared bond and a universally spoken language.